Royce Freeman touchdown. Credit: Isaiah J. Downing, USA TODAY Sports. After years of draft disappointments, the Denver Broncos appear to have turned a page in 2018. 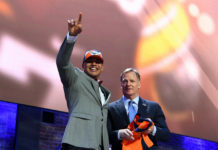 Much of the excitement of their rookie class has been focused around first round pick Bradley Chubb (dubbed by many as the best defensive player in the draft) and second-round pick Courtland Sutton, the “human highlight reel.” However, the Broncos may have also quietly acquired the two biggest draft steals of 2018 — both of which came at the running back position. Royce Freeman, the Broncos third-round selection, and Philip Lindsay, a Colorado-native, have not only climbed their way up the Broncos’ depth chart, but have also been more productive than most of the rookie class at the running back position. Both rookies dazzled in training camp, and that success carried over to the preseason. Freeman was named the starter over incumbent Devontae Booker after a stellar preseason in which Freeman ran with explosion and speed he flashed while at Oregon. Despite falling to the third round of the 2018 NFL Draft, Freeman has outperformed all other running backs not only on the Broncos’ roster, but other rookie running backs as well. That includes some running backs that were taken in the first round. Rashaad Penny (No. 27 overall): 8 rushes, 16 yards 0 TDs (one game). Sony Michel (No. 31 overall): No stats (injured). Nick Chubb (2nd round, No. 35 overall): 45 rushes, 145 yards (3.11 average), 2 TDs. Ronald Jones II (2nd round, No. 38 overall): 28 rushes, 22 yards, 1 TD. Kerryon Johnson (2nd round, No. 43 overall): 15 rushes, 68 yards, 0 TDs. Royce Freeman (3rd round, No. 71 overall): 15 rushes, 84 yards (5.6 average), 3 TDs. He had more touchdowns than any other rookie running back, and his yards per carry average were higher, too. It’s early, but Freeman’s had the best production of any 2018 rookie back to this point. 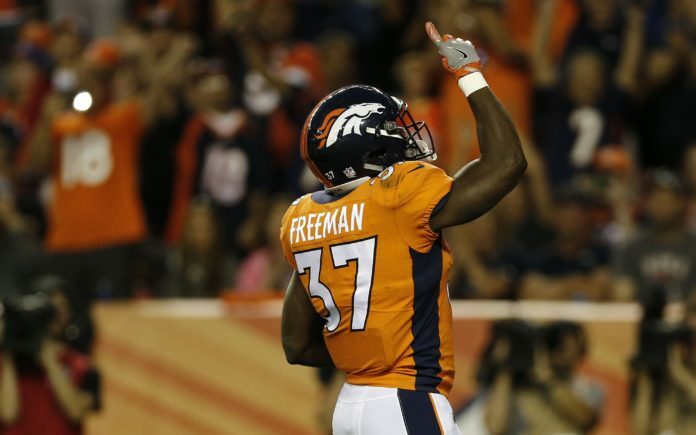 While the Broncos remained faithful to Booker as their starter for all four weeks of the preseason, Freeman’s productivity became too great to ignore, and he was named the starter for the regular season. Despite being the last of the listed running backs selected, Freeman is the only rookie running back that has earned a starting spot on their team. Jones II, once thought to be a potential target for the Broncos, is buried on the Tampa Bay Buccaneers depth chart as the No. 3 overall back. Micehl and Penny, both first-round selections on their respective teams, are battling for backup positions behind veteran starters. Despite their poor running back situation, Johnson has failed to secure the starting nod over ineffective starter Ameer Abdullah and veteran LeGarrette Blount. Lindsay’s NFL journey got off to a tough start when the University of Colorado star went undrafted. Cited as “too small” by most scouts, Lindsay’s chances of making a 53-man roster looked slim. Even when the Broncos did sign Lindsay as an undrafted free agent, the odds were stacked against him. Denver already had Booker, Freeman, 2017 draft pick De’Angelo Henderson, star fullback Andy Janovich, and fellow rookie Dave Williams already on the roster. Lindsay looked like the odd man out of the Broncos running back battle. However, the Denver native continued to prove his doubters wrong. When his strong preseason was done, Lindsay rushed for 70 yards on 13 carries and added four catches for 58 yards and a touchdown. He even saw work with the first-team offense in the Broncos third preseason game. After a productive preseason, Lindsay was given the night off for the Broncos fourth preseason game, a sure sign that he had already secured a roster spot. Lindsay’s production so far has exceeded that of any expectations set for an undrafted rookie. Entrenched as the Broncos starter and third-down back, Freeman and Lindsay appear to be a featured part of the Broncos offense in 2018. 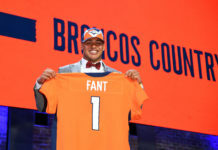 While the regular season will likely prove it one way or another, it appears that Broncos are in a position to walk away with two of the draft’s biggest steals.